Toadie inviting Callum to live with him and being his legal guardian. Kelly explaining that there's an issue with Cal's eyes. Donna telling someone on the phone to leave her alone. Declan telling Steve and Miranda that he'll look after Bridget on the rafting trip. Susan hugging Zeke goodbye, who ignores her. Rachel wondering why Zeke is cold shouldering Susan, and being a brat. Zeke siding with Kyle and Justin as his mates. Andrew telling them they'll have a white water rafting race. The kids are setting up the rafts for their race later in the day. Donna's phone rings, and she tells the person on the other end to stop calling her, switching her phone off, annoyed. Andrew calls the teams together, and Libby asks him if he's really sure that racing is a good idea...but Andrew's insistent. Andrew reminds the teams that there are, some tough areas of the course, including rocks and snags...the teams need to watch out, and put safety first at all times. He also tells the teams that he and Libby will be filming the entire thing, so if they try anything silly, it will all be recorded. 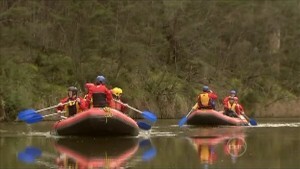 Kyle, Justin, Zeke and Didge are allocated to one raft, with Libby filming. 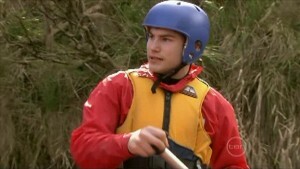 Declan isn't happy, and says that he wants Didge in his raft with him. Seemingly left with no choice, Bridget grudgingly agrees. Declan, Ringo and Donna will be in another raft with Andrew filming. With Bridget still looking hacked off at Declan's protectiveness, he reminds her that he promised Steve he'd look after her. 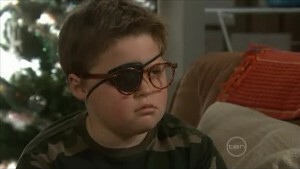 Toadie is trying to get Callum to wear glasses with an eye patch when he reads so that his lazy eye can catch up and get better. Callum is furious, and is having none of it. Toadie reminds Callum that he's doing this so that Callum isn't kept back a year at school, but Callum just wants to go yabbie-ing with Mickey instead, which is what he planned. Mickey and Steve turn up at that moment, and Mickey tells Callum he looks like a dork. Well, that was really sensitive, wasn't it? Kelly suggests that they go lasertagging instead...but Callum has to come back and try the glasses again. Harold is trying to help Elle in the store, but she's having none of it, and tells him to sit down or she'll chuck him out. Two younger kids in their early teens sit at the bench, and call the ‘waitress' over – which Elle is rather displeased about. The girl complains that her latte is too cold, and Elle says she'll get her another one – which will be $2.80. The girl tells her the latte was too cold; Elle points out that it's half finished already. Elle hears her and threatens to call the police – the kids leave promptly, saying they wish they'd never come in in the first place. Toadie tells Callum to wear the glasses and patch whenever he's reading, and threatens him with the Department for Human Services if he doesn't behave himself – and he can't go lasertagging, either. Callum runs off, angry, yelling at Toadie that he hates him. ZEKE: I'll keep an eye on her. Cut to later, and the two rafts are sailing down a quiet part of the river. Libby and Andrew are filming, the visual cutting between the rafts on the river, and the two cameras on the rafts. Raft A with Justine, Kyle, Zeke, Didge and Libby is well ahead, something which Declan isn't happy about. Donna wonders: if one were to tie a bucket behind a raft so that it drags, wouldn't that make it go slower? ‘Yes', everyone agrees. 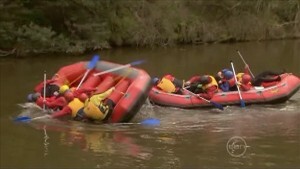 Donna points out that there is a bucket tied to the back of their raft – which, back on raft A, Kyle tells Zeke that he set up as a tactic so that they could win. Zeke laughs. Kyle makes a dig at Declan which Bridget isn't happy about, but Zeke backs up his new mate. Ringo and Declan remove the bucket from their raft, and get back to paddling hard to catch up with the others. Kelly has made Toadie some tea. 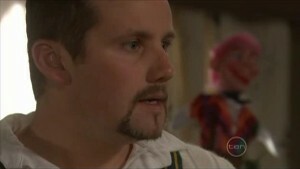 Toadie confesses that he's confused; he can't be Callum's friend all the time, he has to discipline him. But how does he get the balance right? The phone rings – it's the Department of Human Services who are springing a Guardianship Interview on Toadie...this afternoon. Toadie goes to tell Callum – but he's gone from his room. Kelly is asking Steve if Callum came over to see Mickey, perhaps to go yabbie-ing? Steve starts making phonecalls. Harold called the Kennedys but there's no sign of the kids. Toadie starts to panic. Harold and Steve say that they'll go and check the allotment, and drive around the streets looking for them. Toadie thinks he was too heavy with Callum, and Kelly tries to reassure him that he's doing a good job. And then there's a knock at the door. Raft B with Declan, Ringo, Donna and Andrew is closing in on Raft A, and Justin sees them coming. Declan and Ringo are pleased that they're catching up, but Andrew tells them to slow down – there's a dangerous bend up ahead. Libby tells Raft A the same thing, they will let the rafts through one at a time. Justin and Kyle are plotting the second tactic – on Kyle's word they will stop, and immediately paddle backwards, meaning that Raft B will go straight into the back of them, tip over, and move themselves on more quickly. 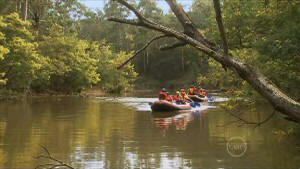 Zeke tells them that it's not a good idea – Libby just said that there was a dangerous bend ahead in the river. Didge wants to know what's going on with the whispering. The lady from the Department of Human Services sits in the lounge, po-faced and stiff. She does not look amused. Toadie tells her a bad joke about lawyers, and offers her tea or coffee again – but she doesn't take stimulants after 3pm. Mickey and Callum are fishing; Callum wishes he could be a yabbie and not have to wear glasses. He doesn't think that Steve would force Mickey to do it. Toadie tells Po-Faced Lady the truth – Callum has run away. And not because of the interview, but because he forced Callum to wear corrective glasses for reading, and now he's disappeared. Callum wonders if he really does look like a dork in glasses, and Mickey says he does. Mickey suggests that Callum asks Toadie to get him some glasses which are cool and it might be better. Callum suddenly races off. Callum returns, feeling better, and being all sorry for running away. He's been thinking, and if Toadie can get him some really cool glasses, he promises to wear them for reading. He then realises that something's up, and asks what's happened. Toadie tells him: a lady from the DHS came over for an interview. CALLUM: Are they gonna take me away? Andrew tells Raft A to go through the dangerous bend, as Raft B has now closed in a little bit. Libby reminds them to be really careful, but Justin and Kyle don't seem to care about this one little bit – they furiously back paddle, and Raft B goes straight into the back of them, tipping the first raft over into the water, and Justin, Kyle, Zeke, Libby and Didge straight into the path of the raging water. No-one can be seen above water, and Declan screams for his girlfriend. Underneath the upturned raft, Zeke and Libby are holding onto each other's hands, and keeping their heads above the water. But Zeke can't hold on much longer, and cries out that he can't do it, his hand slipping from his sister's. Raft B is paddling to shore, and running along it to the upturned raft, they call and scream out for their friends. Justin makes it out the river, pulled up by the others, and Kyle too. They haven't seen anyone else. Declan goes to launch himself into the water, but Andrew pulls him back, telling him not to be stupid. Dec screams for Bridget again, and they all call out for Libby and Zeke. But there's no sound, and no movement, and nothing but the raging water left in front of them.